Matthew Peterson: And let me ask you a bonus question. Matthew Peterson: Actually, I’m going to ask you another one I wasn’t planning on, and then I’ll ask you another one, just really quick. ‘Cause I think this is interesting–what type of feedback have you gotten in regards to Claire essentially having 2 husbands, one in the present and one in the past? Diana Gabaldon: [laughs] Well, weirdly enough, that particular aspect doesn’t seem to bother anybody. There are hugely divided and passionate opinions regarding her husband in the 20th century, as to whether he’s a tragic figure because, you know, his wife’s essentially disappeared into the past for 3 years, came back pregnant with another man’s child and has rather obviously remained in love with this man. Diana Gabaldon: Or is he a cad who should have divorced her and let her go on with her own life and so forth. Or is he a good guy because he essentially fell in love with her daughter. You know, took the baby as his own, acknowledged her and raised her and was by all accounts and extremely good father. So you have the friends of Frank and you have the foes of Frank. You can get huge wars about this man going on all over the place. But as to Claire actually having 2 husbands, that actually doesn’t seem to bother anybody. Matthew Peterson: How interesting that is. And then, the story of how you got published is anything but typical. Diana Gabaldon: Yeah, I gather. Matthew Peterson: I think it’s such an interesting story. Tell us a little bit about how you got your agent and how quickly he sold the rights to Outlander. Diana Gabaldon: Well, keeping it very short here. I had become a freelancer for the Computer Press, while working at the university and so forth. As a result of that, they sent me a trial membership to CompuServe, so that I could comment on a support forum for some software that I was reviewing. And in the course of that I stumbled into the CompuServe literary forum, which is a bunch of people who like books. It’s not a writers group, but there were a lot of writers there as well as a lot of readers and people who like to talk about books. And for someone with 2 full time jobs and 3 small children it was the ideal social life. So, you know, I’d been hanging around there for a year or so, just talking to people. This was long before the days of AOL or chat rooms, it was, and still is, though we’re now called the CompuServe Books and Writers Community, a bulletin board system, where you leave a message for specific other person, but anyone who sees it can comment on it or add to the conversations. Well, so I had been hanging around there for a year or so before I began writing my own book, but I was not going to tell anyone what I was doing, including these people, ‘cause I wanted to be sure that I could actually write something coherent before I started talking about it. I’d been writing for maybe eight months or so when one night I was having an argument with a gentleman online about what it was like to be pregnant. And he said, “Oh I know what that’s like, my wife’s had 3 children.” And I laughed, “Well, mister, I’ve had three children.” And he said, “Can you tell me what it’s like?” And I said, “I can, yes, but it’s kind of complex. I don’t know that I could explain it in a thirty line message slot.” Which is all we had back then. So, I said, “I have this piece I wrote a few months ago, in which a young woman explains to her brother, in some detail, what it’s like to be pregnant.” I said, “I’ll put that in the library and you can read it.” So I did, and everyone who’d been following the argument went and read this piece. They all came rushing back and they said, “This is great! What is it?” And I said, “I don’t know.” And they said, “Well, where’s the beginning?” And I said, “I haven’t written that yet.” And they said, “Well, this is cool, put up some more of it.” So, whenever I had a chunk that would stand on it’s own, without a lot of explanation, I would put it up. And people got more and more interested in these. And they began to say, “Well, this is cool. You should try and publish it.” And I said, “Well I don’t even know what kind of book it is. But eventually I’m going to write a book I want to publish. You know, for the sake of argument, what do you think . . . what should I do?” Well I knew a number of the professional writers who hung out there by this time and all of them, without exception said, “You should get a literary agent.” They said, “An agent can do two things for you: he or she can get your manuscript read much more quickly than you can do by yourself, and if the book does sell, then he or she can negotiate a much better contract than you can do.” And I said, “Well that makes sense. How would I find an agent?” And they began giving me advice and so forth. Well, the up shot of all this was that whenever I was talking to a professional writer, I would ask him or her questions about agents: Do you have one? Is it the same one you started with? If it’s not, why not? If you write more than one kind of thing, do you have more than one kind of agent? How much do you pay them? Is it worth it? So forth and so on. And I had begun kind of collecting their stories and zeroing in on this particular agent named, Perry Knowlton, who I thought might be a good match for me. He had very eclectic tastes, so he wasn’t afraid of very long books, or of very odd books, which it had occurred to me I had. And so I thought he might be good, but I couldn’t get at him. He didn’t take unsolicited queries. And so I was thinking, “Well, you’re not finished with the book, just go on asking questions. Either you’ll figure out how to get at him or you’ll find someone easier.” So I did and one day I was talking to a guy named John Stiff, a friend who writes science-fiction mysteries and I said, “Well, I’m asking everyone about agents, John, do you have one?” And he said, “Well, yeah, by coincidence, it’s Perry Knowlton, you know the same as so and so.” And he said, “I know you’re almost ready to look for an agent, would you like me to recommend you to him?” I said, “Well, sure John, that would be nice.” I was afraid John would be run over by a bus or leave CompuServe before I finished the book. I said, “Yes, yes, go ahead ask him.” So, he essentially wrote Perry just a straightforward pen and paper note saying, “This woman’s worth looking at, I think.” Perry was an older gentlemen, very charming, who never touched a computer in his life, I’m sure. So, you know it was just a straightforward, pen and paper note that said you know, I had met John at a cocktail party or something. Which, you know, in effect, I did, it was just online. Anyway, I followed that up with my own query letter and I said, “Mr. Knowlton, I’ve been writing and selling non-fiction, by myself for several years, but now that I’m writing a novel, I understand I need good literary representation and you’ve been recommended to me by John and Judy and all these people whose opinions I respect.” I said, “I have this very long historical novel, I don’t want to waste your time. Would you be willing to read excerpts from it?” Well, I didn’t tell him I wasn’t through writing it . . .
Diana Gabaldon: But he very kindly called back and said, “Sure”, he’d read my excerpts. So, I hastily wrote a 26 page single spaced synopsis, because I did, at this point, know most of what happened in the book, and sent that with my excerpts. Well, he took me on, on the basis of an unfinished first novel, which is not common now. It wasn’t common then, but it was very lucky. So, six months later, I finally finished the book and sent him the manuscript. He sent it immediately to 5 editors who he thought might like it. And within 4 days, three of them had called back wanting to buy it. So, he negotiated amongst them and emerged with a three book contract. And, you know, bam, I was a novelist. Matthew Peterson: Bam [laughs] But you got the agent, before the book was finished. Diana Gabaldon: That’s right, yes. Matthew Peterson: Wow! That’s just amazing. That was quick too. One week and three offers! Diana Gabaldon: That’s right, mm hmm. Matthew Peterson: Yeah, that’s some motivation for everyone out there. Diana Gabaldon: You don’t know what you can do, til you try. Matthew Peterson: Yeah. Thank you so much, Diane. Diana Gabaldon: Oh, my pleasure. Matthew Peterson: I really appreciate this. You know, like you said, it’s hard to put you in a hole, what genre . . .
Diana Gabaldon: Well, you name it. So far I’ve seen my books sold as fiction, literature, historical fiction, historical non-fiction, science fiction, fantasy, romance, mystery, military history, and horror. Matthew Peterson: Not paranormal? You’ve got a little paranormal in the Lord Grey . 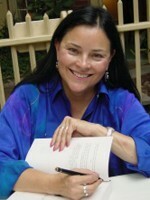 . .
Diana Gabaldon: Oh, the thing is that paranormal is not actually a designation in book selling terms. Diana Gabaldon: I mean, they don’t have a shelf called “Paranormal” in a book store. Matthew Peterson: Yeah, yeah. Well that’s funny. Diana Gabaldon: Yeah, I’m not kidding when I say they’re not romance, and that’s not an objection to romance. I like well-written romances, but that’s not what I write. Diana Gabaldon: If you call it that, it’s going to cut off the entire male half of my audience. Matthew Peterson: You write pretty fast, too. You told me, not too long ago that without interruptions you can write like 20 to 30,000 words a week in optimal conditions? Diana Gabaldon: Well, that’s towards the end of a book when I actually know everything that’s going on and I’m working flat out, you know, 14 hours a day. Luckily that only goes on for a few months or I’d die. My walking pace, normally is about 1,000 words a day. That’s through the first couple of years of a book. Matthew Peterson: Uh huh. Okay. Matthew Peterson: You get that adrenaline rush and you just keep going. Diana Gabaldon: Yeah. But as I said, well, it seems easier to look things up than to make them up. And if I turn out the imagination, I can steal things from the historical record, which works really well as a matter of fact. Diana Gabaldon: But I sit there and stare at that, and I take words out and I put them back and I add new clauses and delete them and all the time the back of my head is kicking up questions like, Where are we? How is the light falling? What time of year is it? Did someone just say something? Did someone drop something on the carpet over there? Do I feel liquid running, or is it a heavy object? Things like that. And little by little the scene takes place, you know, by working forward and backward and forward and backward, I’m not a rough draft kind of person. I fiddle as I go. I can’t let go of a sentence until it is phrased as eloquently as I can manage. Consequently, I will have been through a scene, literally hundreds of times by the time it’s finished. But then it is finished, until it takes its place in a larger assembly. Diana Gabaldon: [referring to the storyline of Claire’s daughter] Who hadn’t gone to the past at one point, have returned to the future, at the end of A Breath of Snow and Ashes. And we find them in the future, here in this book, fiddling into the ancestral home at Lally Brock in the Scottish Highlands. Dealing with the problems of re-integrating themselves as a family and into 20th century society. They stay in touch with Jamie and Claire, so to speak, through a casket of letters that Jamie and Claire had written, collected and preserved through the centuries to be handed on to them. So they have this tenuous link with the past, but while reading these letters they began to realize that the highlands around them are no more safe in the 20th century than they were in the 18th. Diana Gabaldon: More to John Grey, the sub-series. I hate to call it the spin-off because it is actually part of the main Outlander series and since it is still him, you know, he has the same consciousness and contacts. So, he does have references and thoughts and memories and plans, with regard to what’s going on in the main books. But his books are focused on what was going on with him, when he was off stage from the main series, so to speak. But you do get flashes of the characters from the main series through his. Matthew Peterson: His books are a little bit more like historical murder mysteries, a little feel of that, right? Diana Gabaldon: Yeah, yeah, they are shaped like historical mysteries. There’s a book about him called, Lord John and the Hand of Devils, which is, in fact, a collection of three novellas, which were written for anthologies on request. And those are called Lord John and the Hellfire Club, Lord John and the Succubus, and Lord John and the Haunted Soldier. And they do, in fact, all have a faint super-natural element going through them. Even though it doesn’t touch him directly, he’s not a time traveler, as I said. Diana Gabaldon: [referring to being asked to write a short story] So I said, “Sure I’ll do it”. So I was casting around for what to write about exactly. I didn’t want to write about Jamie and Claire, because I don’t plan the books ahead of time. And if I did something of significant moral stakes and emotional weight, as to create a good story, that would be some event that I would have to take account of in later books. And I said, “I don’t really want to have the rocks in my way that I have to deal with. And so I’d rather not write about them.” But, I said, “There’s Lord John.” He’s what I call a mushroom, one of those characters that just pops up and walks off with any scene he’s in. And because of who he is, he’s a gay noblemen in the 18th century, he’s a career army officer. If anybody finds out what he is, you know, he’s dead, his family is disgraced, his regiment is scandalized. You know it was a capital offense to be a gay man in those days. Diana Gabaldon: Anyway, because of who he is, he lives with these constant conflicts, which make him an extremely interesting character in almost any situation which he finds himself in is going to be a good one, from a story telling point of view. So, I said, “Oh there’s Lord John. Why don’t I write about one of these lacunae in the story in which he was off stage?” Because obviously he was having an interesting time on his own. So, I did that and I wrote Lord John and the Hellfire Club, in which he gets involved in a murder in his regiment, which has connections to Sir Francis Dashwood’s notorious Hellfire Club. Anyway, it went well. Everybody liked the story. But it was a British Anthology, which means it went out of print within a year or two, because they always do. And just about this time, people in the U.S. began hearing about it, saying, “Oh we love Lord John. Where can we find this story?” And I said, “Nowhere, essentially.” We e-published it for a while. I had some friends who were starting up a small e-publishing company and asked, “Do you have any old stories under the bed we could use?” And I said, “No, and if I did, I certainly wouldn’t expose them to public view.” But I do have this and there’s absolutely nothing else I can do with it at the moment. If you’d like to try e-publishing it, that’s fine. So, they did and it was quite successful, by e-publishing terms, which, in the terms of the times, meant it sold about 60 copies a month. But you know, even so, it is significantly less long and less complex than my regular novels, like Brotherhood of the Blade, I knew that one was a novel, going into it. It’s more like my regular style. Diana Gabaldon: [describing the intro to Outlander] Well, they find, what appears to them to be an English woman wandering the countryside in her underwear, you know, in her shift. And this is a time in which English women just plain didn’t go to the Scottish highlands. It was like outer most Borneo and no one would go there except the army, who had to. So anyway, they’re very bemused by this. They pick her up and take her back to their castle, intending to make sense of her. Well, of course, she is wanting to get back to the stone circle and back to her husband, in the 20th century . . .
Diana Gabaldon: I won’t go into all the permutations of time travel and going back and forth and who goes back and forth and so forth. As I say, it is a very long and complex story. But at the end of Breath of Snow and Ashes, she’s with Jamie, her 18th century spouse and her soul mate and all that. Diana Gabaldon: [describing one of the threads of An Echo in The Bone] They have just been burned out of their house in the backwoods of North Carolina. Their community has sort of fallen apart around them as a result of the pressures of the oncoming revolution. And they find themselves in the ashes of their house, and all this, Jamie declares at that point that they are going back to Scotland to get his printing press, which he had been obliged to abandon there in an earlier book. Because, you know, he’s in his fifties now and saying while he can still lift a sword and will when required to do so, it’s occurred to him that a printing press is a much more effective weapon. And so he’s going to go get the press and come back to fight. Well, he’s got a couple of other reasons for wanting to go to Scotland. One is his nephew, young Ian, who in an earlier book was kidnaped to America and that’s what got Jamie and Claire essentially to America, was in order to rescue him, which they did. But Jamie had promised his sister to take her youngest son back home, which he hasn’t done yet. And he thinks this may be his last chance to get young Ian, who’s now a young man of 25, home. And so he tells Ian, you know, he’s going home, whether on his feet or tied in a sack. Diana Gabaldon: [describing another thread of An Echo in The Bone] Lord John is a career diplomat. He was a career soldier. And he has extensive experience in spying. He was a member of England’s black chamber for a long time. All the main countries of Europe, main cities in Europe, had black chambers. These were the gentlemen who intercepted diplomatic pouches, decoded the contents and passed them on to the relevant parties. Well, Lord John has a lot of experience in this line, and his son William, of course, is now in the army, as I say, and sort of torn between the excitements of battle, and wondering what it will be like when he finally kills someone, and the charms of intelligencing. You know, spying was vulgar, you know, a gentleman would never do that, but if he was going somewhere anyway, he might as well pick up what intelligence he could along the way. And intelligencing was very respectable. So, William is sort of doing both these things, or beginning to get his feet wet in both areas.